Why Don’t All People with Long QT Syndrome Have an ICD? An ICD is implanted into patients with long QT syndrome to recharge the heart should it go into sudden cardiac arrest. So why aren’t ALL people with long QT syndrome given this implantable cardioverter device? After all, sudden cardiac arrest from LQTS often means sudden cardiac death. 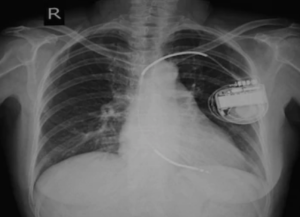 The ICD is quite efficient at starting the heart up again multiple times in the same patient, for which without the device, the patient probably would have succumbed to sudden cardiac death. Due to this efficacy, the patient is less restricted as far as physical activity, than without the ICD. Many young athletes, after being diagnosed with LQTS, are given an ICD to allow them continued sports participation. There are also other management protocols in place for these young patients such as daily medication. But shouldn’t all LQTS patients get an ICD? Wouldn’t this provide enormous peace of mind for them and truly cut down on the chances of a sudden cardiac arrest? In fact, not even all active adults receive an ICD as part of their LQTS management regimen. “LQT syndrome is made up of many different genetic mutations and has a varied presentation,” says Glenn Meininger, MD, Director of Cardiac Electrophysiology Services for the Baltimore region of the MedStar Heart & Vascular Institute. Dr. Meininger explains, “Some patients are at greater risk than others. Generally, patients with LQT syndrome can lead a full and active life without the need for a defibrillator. The old school of thought, which has received a few major revisions fairly recently, was that anyone with LQTS was instructed by their treating physician to avoid all sports, jogging, hiking and other sustained activities that add burden to the heart. Even swimming was prohibited, since the risk of drowning comes with LQTS. Nowadays, the athletic patient with this rare congenital condition is managed on a case-by-case basis. This includes involvement of their coaches and other relevant trainers so that they are fully aware of the athlete’s condition. An automated external defibrillator device is also always on hand during practices and games. Risks vs. benefits of sports participation for each patient are very carefully weighed on an individual basis. The old-school restriction of “You can only bowl, golf, garden and throw darts” has been lifted. These restrictions have been lifted, in particular, for those with asymptomatic LQTS. Their condition is discovered when they’re tested after a family member is diagnosed following cardiac arrest or unexplained fainting. Long QT syndrome tends to run in immediate and extended families. The asymptomatic individual may have been an athlete or fitness enthusiast for years, with no symptoms, before learning they had this genetic condition. 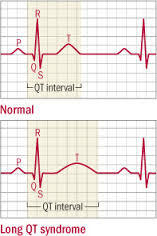 LQTS type 2 is when sudden cardiac arrest is more likely to be triggered from sudden loud noise or a sudden situation of surprise vs. physical exertion. People with this type must take measures to avoid environments for which loud unexpected sounds and surprises may occur. For example they do not use loud jolting alarm clocks. Their doorbells are soft rather than startling. Attending fireworks displays and going to shooting ranges wouldn’t be a smart idea. Sudden cardiac arrest in these patients may be triggered by the unexpected sight of a car darting out in front of them while they’re driving, or even the unforeseen crashing sound of a china plate breaking upon hitting the floor. People in their household are instructed never to slam doors. An ICD would serve these patients very well, since it’s impossible to avoid being startled by sudden loud sounds unless you never venture outside the house. There are eight types of LQTS. Whether an ICD is recommended is based on their individual situation. However, a personal history of fainting, blackouts and especially a stopped heart will surely warrant the need for the implantable cardioverter device. Dr. Meininger is board certified in cardiac electrophysiology, cardiovascular disease and internal medicine and is widely regarded as an expert in the use of multiple modalities to treat cardiac arrhythmias. Why Don’t Beta Blockers Alone Allow Sports in Long QT Syndrome? How Can Only Milliseconds Make a Difference in LQTS? My Child Has LQTS: Does This Mean the End of All Sports? Does Genetic LQTS Affect Older Adults or Just Kids & Teens?